Photo: Anton Goreczky House, ca. 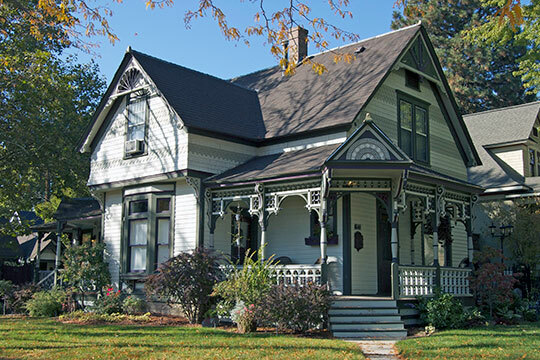 1900, 1601 North 7th Street, Boise, ID. Listed on the National Register of Historic Places in 1986. Photographed by User:Charmar (own work), 2012, via Wikimedia Commons, accessed August, 2013. The Ada County Courthouse is located at 200 West Front Street, Boise, Idaho 83702; phone: 208-287-6840. On December 22, 1864 the state legislature passed an act dividing Boise County and creating Ada County and locating the county seat at Boise City. Boise had been established as the permanent state capital earlier that same month. The county is named for Ada Riggs, daughter of Boise pioneer H. C. Riggs. Ada County's geography and climate shaped the history of its agricultural development. Located in southwestern Idaho, Ada County is transected by the Boise River, a tributary of the Snake River and part of the great Columbia River drainage system. The Columbia River drainage system connects the Rocky Mountains to the Cascade Range and Pacific Coast. Four major streams feed the Boise River in Ada County: Indian Creek, Willow Creek, Fifteen Mile Creek, and Dry Creek. The county's northern section consists of broad river bottom lands and terraces, rolling hills, and the beginnings of mountains. Its southern section is a semi-arid desert plain, now fed by an intricate system of irrigation canals leading from the Boise River and its dams. From river bottom to sage-covered hills, Ada County averages 2,500 feet to 3-4,000 feet in elevation. This semi-arid region receives only 8.5 inches of precipitation annually. Dry, hot summers and freezing winters shape its seasons. These climate extremes are tempered by the river valley's location between the Owyhee Mountains and Boise's foothills, called the Boise Front. Ada County's topography a broad and rich river valley bounded by foothills, plains, and mountains created a natural corridor through southwestern Idaho to the Pacific Northwest. Over thousands of years, Native Americans, explorers, fur traders, missionaries, and Oregon Trail emigrants traveled through the valley and rested along the Boise River's tree-lined banks. Gold and silver deposits brought miners and their suppliers into the region, marking the beginning of semi-permanent settlement. In 1862, George Grimes and Moses Splawn explored parts of the Boise Basin and found gold at what was later named Grimes Creek. Major strikes also occurred in the Rocky Bar area, east of Boise Basin, and the Owyhee Mountains to the southwest. Miners from played-out Oregon, California, and northern Idaho gold camps came along the Snake and Boise rivers to these new strikes. Mining camps grew into small towns, leading to the founding of Idaho City, Placerville, and Silver City, all located in the mountains surrounding the Boise River. In less than two years, over 6,000 people lived in the Boise Basin, making it the largest population center in the Pacific Northwest. Mining and related industries also brought the first non-native ethnic and minority groups to the area. Chinese and Basque immigrants followed the gold trail from California to Idaho (the Basques finding a niche in the sheep industry that supplied the mines), and a few African-Americans settled in the mining camps of Silver City, Quartzburg, and Idaho City. Some of these prospectors, especially the Chinese and African-Americans, were harassed and driven from their claims. They found other occupations such as tending cattle and sheep, or providing services in local communities. Many Basques and Hispanics drove freight wagons and ran pack trains out of Boise. Most Chinese and African-Americans eventually moved to burgeoning towns, working in laundries, barbershops, restaurants, and other businesses. Many who originally came to mine made a more profitable living by raising livestock and vegetables to sell to their counterparts, rather than mining for elusive gold. Small ranches sprang up along the Boise River and its tributaries as settlers claimed land with readily available sources of water. There they could easily raise stock and crops and had easy access to local markets. The Boise River Valley's earliest settlers exemplified this pattern of settlement. William Richey and brothers Tom and Frank Davis were former Boise Basin miners who scouted Boise Valley for ranch sites. In 1863 they settled on Cottonwood Creek near the Boise foothills, and built cabins out of native trees. The Davis brothers eventually had the first fruit ranch in the Boise River valley. "Captain" McKay, an old Hudson's Bay Company trapper, also had a ranch four miles down river from the Davis ranch. Others farming along the river included Bill Little, located near Warm Springs, and John McLean, who settled near the Ritchey-Davis ranch. As mining and farming grew in 1863, conflict arose between Native Americans and non-native emigrants over southwestern Idaho's natural resources. Miners and settlers requested federal protection from Indians, and the U. S. Army scouted several sites for construction of a fort. In 1863. Major Pinckney Lugenbeel chose a location at the crossroads of the Oregon Trail and the road to the Boise Basin gold mines, situated near the Boise River, and near Boise City which was also platted that year. By then, approximately 100 people were already living in the valley. By 1864. Idaho Territory was created and Lewiston, in the Northern territory, was chosen to serve as its capital. The capital was subsequently moved to Boise City in late December of 1864. The same year Ada County, named after the daughter of H. C. Riggs, one of Boise City's founders, was formed. Madeline Kelley Buckendorf, The Arrowrock Group, Inc., Historic Rural Properties of Ada County, Idaho, nomination document, 2001, nomination document, National Park Service, National Register of Historic Places, Washington, D.C.